Wondering if the Rubbermaid FreshWorks Produce Saver really works? 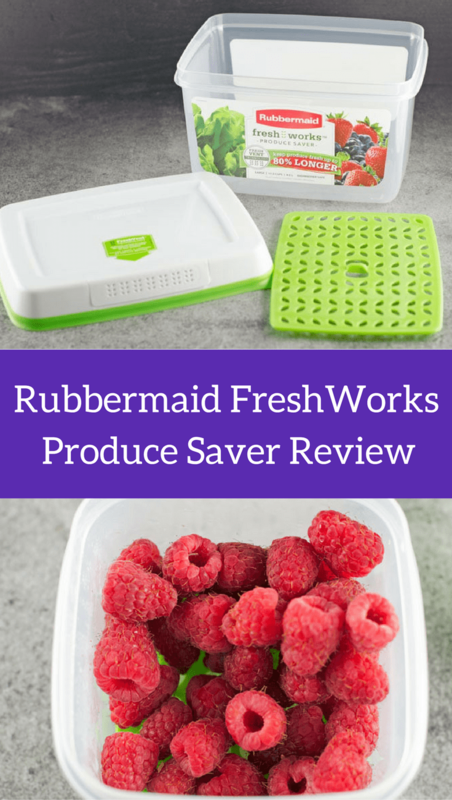 Keep reading our Rubbermaid FreshWorks Produce Saver Review to find out! This is a sponsored post for SheSpeaks/Rubbermaid. All opinions are my own. I feel so lucky that we are blessed to almost always have a really well-stocked fridge. I love that we live in a time that it’s fairly easy and affordable to have a variety of fresh produce year round. However, I’ll be the first to admit that we waste a LOT more food than I’d like. Sometimes we just don’t get around to eating those berries and salad mix before they go bad or containers get pushed to the back and out of sight. 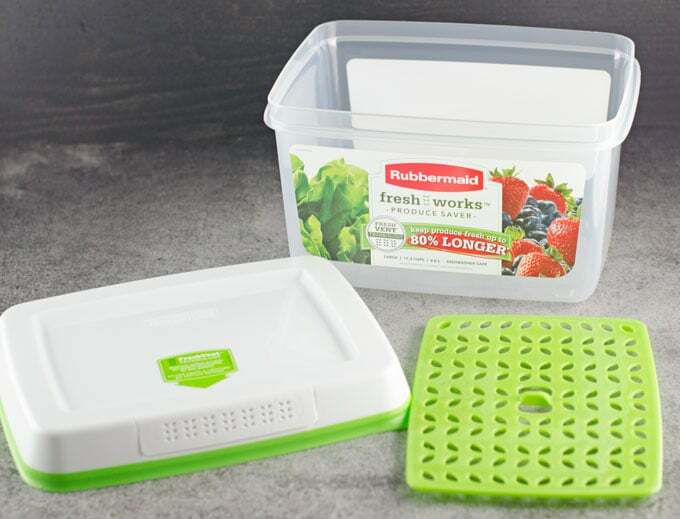 I’m always looking for ways to help fresh produce last longer so I was quite interested in doing this Rubbermaid FreshWorks Produce Saver review. So, do they really work? Keep reading to find out and also enter to win your own set of Rubbermaid FreshWorks. 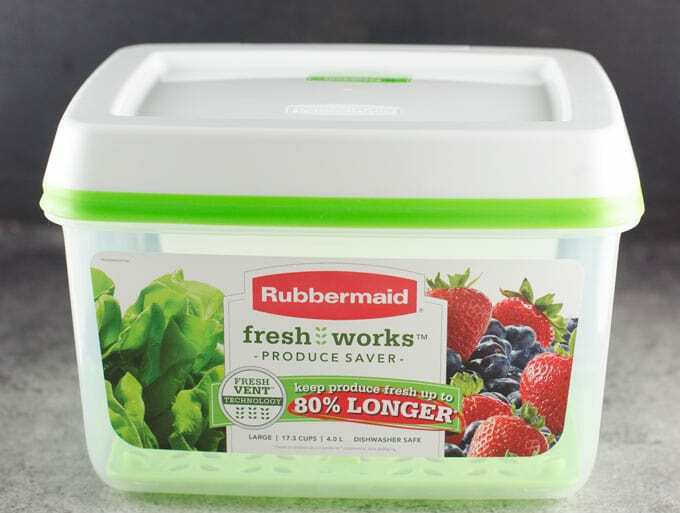 The Rubbermaid FreshWorks Produce Saver is a food storage container made to help keep produce fresher up to 80% longer* than traditional produce packaging by using FreshVentTM technology. It works by regulating the flow of oxygen and carbon dioxide to create the optimal environment for produce to stay fresh. There’s also the CrispTrayTM that elevates the produce reducing exposure to moisture and increases airflow. 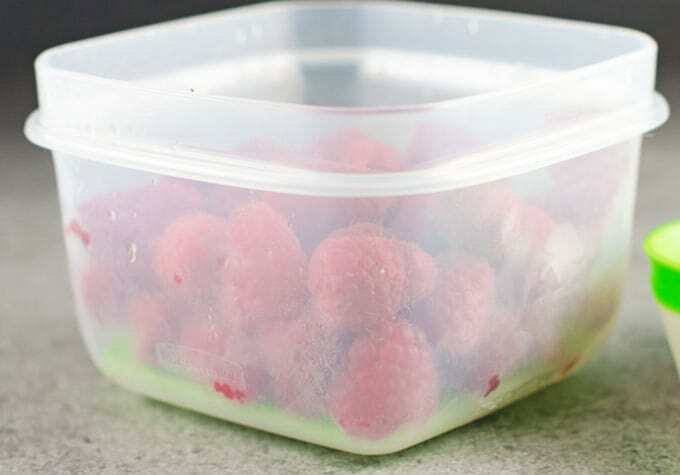 To use the containers all you have to do is remove the produce from its original packaging, place into the containers on top of the tray, and then put on the lid. All the pieces are reusable, even the lid filter that doesn’t need replacing, and can be washed on the top rack in the dishwasher. They’re also BPA-free and can even be used in the microwave. I love fresh produce but it goes bad so quickly. I’ve gone so many times to make a salad for lunch only to discover that half the salad greens have turned into a slimy mess in just a few days. Raspberries are one of our favorite berries to eat but if you leave them in the fridge for more than a day they are usually next to inedible. 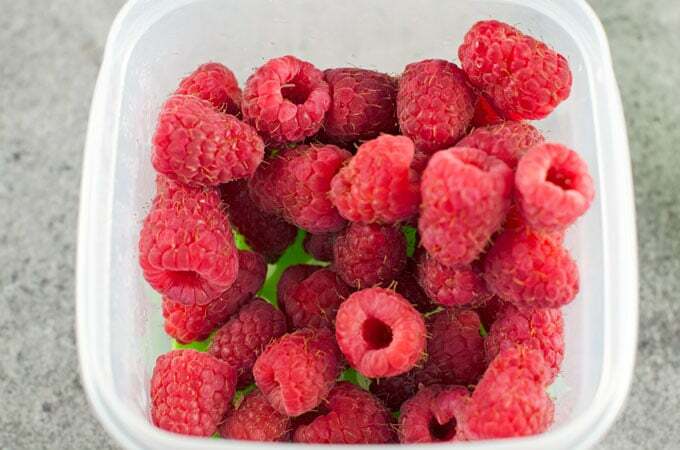 So, I knew that to really test out these containers my first test would be raspberries. I picked up a pint of raspberries at the store and when I got home put them right into the small container. It was hard to wait it out knowing how quickly raspberries usually go bad but I waited over 4 days to see how they were doing. Much to my elated surprise, the raspberries were still super fresh and not mushy at all. I think they could have lasted even a couple days longer which is pretty impressive. You can see what they looked like on day 4 with the picture above. One important thing to note is that Rubbermaid does recommend to NOT wash or cut your produce before using these containers. It’s not ideal if you’re looking for ready-to-eat produce but the containers do work really well on whole, unwashed produce in my experience. Do be careful when opening the containers as the lids and bottoms of the container may have a good amount of water built up. This is totally normal and is part of what is helping your produce stay fresh! I also tried out some strawberries in the medium container. I did leave them in the original container for a day before putting them into the Rubbermaid FreshWorks Container but I just checked them today, 8 days after purchasing them, and they still look great! I haven’t tried lettuce yet as I got so tired of throwing away half a container of greens that I started buying small bags of salad but I’m now really excited to see how it works out. Do We Recommend Rubbermaid FreshWorks Food Saver Containers? Yes! This is one product I’ll honestly buy more of to use in our everyday life. I feel so good knowing that we’ll be able to eat the healthy fresh produce we love without wasting nearly as much money because we end up throwing half of it away since it went bad. The giveaway has now concluded. 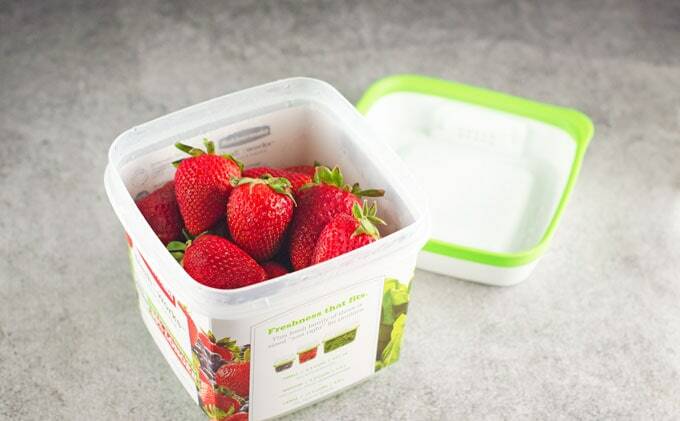 Congrats to our winner, Jen M.
Want to win a 3-piece set of Rubbermaid FreshWorks Produce Savers like pictured above? Thanks to the generosity of Rubbermaid and SheSpeaks here’s your chance! Giveaway is open to legal residents of the 50 United States + DC who are 18+. All entries must be completed on the Rafflecopter below by 5/17/17 at 11:59 PM ET. See Rafflecopter widget for full rules. Bananas of course, but I do end up throwing out a lot of tomatoes that go bad before we can get to them. I put them in the compost pile though and end up with little tomato plants I can replant, but I’d much rather have the tomatoes last longer! Thank you so much for the chance. I have to throw out lettuce the most but strawberries are a close second. I’ve had to throw away strawberries that were moldy. We have to through bananas out. I hate to but the just don’t last that long. I throw berries away and salad most often because they get mushy. berries….always seem to be the berries that go bad fast in my house. Im tired of my produce spoiling before we get to eat it. It happens all the time. Lettuce goes bad so darn fast. Lettuce is what we throw away most often. I would love to keep it fresh longer! I have to throw away lettuce and spinach all of the time because it just doesn’t stay fresh. It is definitely lettuce! Thanks for the chance to win such an amazing giveaway. I think I throw away strawberries most often.